Yep. Movin’ that plot right along. Glad to finally reintroduce this fella back into the comic, too. Kevin Abel. He seems to have powers? He’s back! And his name’s Kevin, huzzah! Been waiting for that guy to come back since forever. Poor Patches. It’s just not his day. THE CREEPY EYESMOKE IS BAAAAACK. Looks like that shot down my previous theory! The plot- it thickens. If Schtein’s going to go down the route of “Mad Scientist”, this guy is probably gonna be some sort of benefactor for him to get out of prison. I wonder if JayJay and Phineas are going to make the exodus from jail aswell? Jay Jay would make a good Igor. “Go down” the Mad Sientist route? Methinks our man Schtein took that turning a way back! I love all of these character designs. They look sort of retro. It fits. YESSS I have been waiting for this guy! I love his special effects, it looks like he’s summoned up the ocean to splash behind him dramatically! Oooooh the plot thickens and the man returns. Now my head is all filled with theories about what might be going on here. Also, I am in love with Mr Johnson’s cheekbones. Abel’s powers kind of remind of what Schtein and his team were working on before he went and blew then all to hell. Passing through dimensions to get to places quickly. Yes. The first time we saw this Abel guy, he seemed to “merely” have psychic powers of telepathy and hypnotism. Kind of like a PsiCop. Now suddenly he can teleport, too, it appears? Wow. Did mankind discover psionic powers (all that talk about “mutants”) but it didn’t become common knowledge because secret organisations snapped them all up? Twigs, you are just having one bad day. First your eye gets gouged out, then you get threatened by your boss that he will scratch out the other one, and now Mr. Abel is popping out of nowhere no doubt too close to your bubble of personal space. God Twigs, you’re almost as fun to torture as Herville. Of all of the webcomics I read, this one by far has the best plot. You keep amazing me with your skill. This comic is SOO utterly awesome! Some things seem inspired by Fallout which is my favorite game ever…. 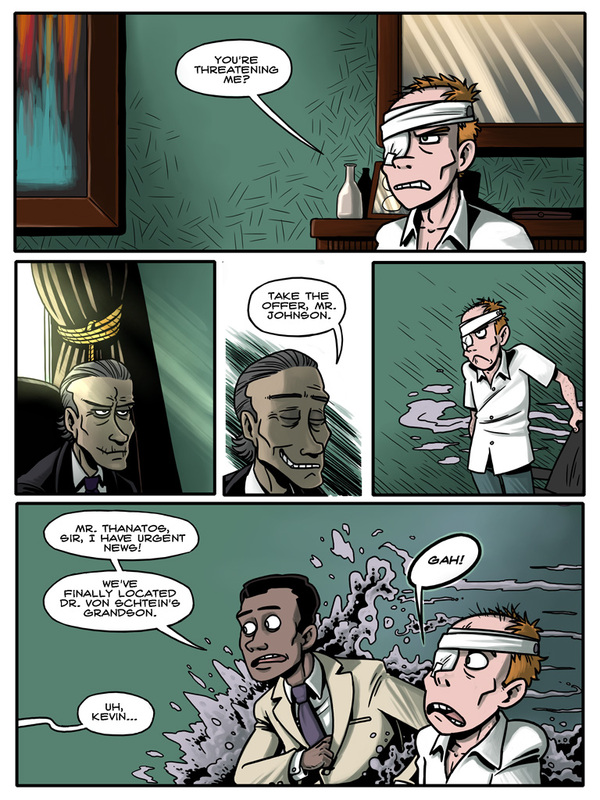 The thing that i admire most is that the comic manages to be funny yet it is not the dominating trait – you actually write a compelling story not to mention the character minds are done right… looking at Dr Schtein for example, in his situation i would act just the same. Keep up the good work, explaining to the world that supervillains are nice people too! It’s like my favorite game or something. Yyyyyyyesss, creepy smoke guy returns! And I love him already! Also, Thanatos is such an awesome name. It means “death”, if I’m not mistaken. The antagonist in Gargoyles, my favorite show as a kid, was named Xanatos. Thanatos? Like the Greek incarnation of Death? hahah, that’s hilarious, because I was actually updating twice a week for a few months, and it was making me very depressed. I basically never left my room when I was doing that. It’s why I had to go back to once a week. Am I the only one who thinks that Mr. Johnson would be a perfect #2 to Dr. Schtein (like in Austin powers) ?? Oh yeah, I forgot about that guy. Damn, I haven’t seen that movie in years. Too bad only the first movie’s worth a damn. I had such high hopes for the sequals. Not enough things are set in James Bond/Secret Agent Man type universes. Nah… i think my favourite side villain , Boris Grishenko would do… He was awesome computer wizard, and eastern european like me.. in fact when i first saw Goldeneye, it made me learn pen-spinning (that was back in high school) … pretty much my favourite character out of Bond movies..
BTW, I can’t seem to go to your formspring. Did you delete it or something? So he is back. I like his smoke powers. Ooh, I’m good at this. I’m guessing Kevin’s suit produces some kind of spacetime distortion field that lets him move really fast. The purple dust is probably coalescing matter generated by spillover dark energy used to fuel the process.